When you are searching for the right caster for a unique job, you may find that it is hard to locate the exact caster for your needs. If you have access to only one or two different caster manufacturers, you might quickly find that you are going down the route of designing your own caster, and that can be expensive. That is why Douglas Equipment is here to help. Douglas Equipment has formed alliances with over a dozen different caster manufacturers, so we know that if there is the right caster to suit your unique needs is available, we can find it. Since we do a large amount of business with these manufacturers, we can also get much better wholesale pricing than an individual can, and we can pass these savings along to you. This is why our customers know that we can get them the benefits of wholesale pricing for the casters they need. With over 200,000 different caster models in their catalog, the Colson Caster Corporation is one of our key manufacturers. Since they first began in 1885, Colson has shown a commitment to caster technology that has made them an industry leader in industrial casters. 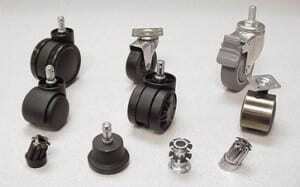 As one of our leading caster suppliers, we can source a variety of Colson casters that might suit your needs. Colson Kinpinless Enforcer Swivel and Matching Rigid: This model is meant for your larger caster needs. The caster includes larger diameter wheel options and is available with a zinc plated finish, as well as the kingpinless swivel design that eliminates swivel section failure. Caster capacities range from 680 – 4,500 lbs. Wheel material options include Cast Iron, Forged Steel, Phenolic, and Mold-on Rubber, and come in wheel diameters of 6”, 8”, 10” and 12”. Colson 6 Series Enforcer: These casters have an attractive and durable zinc finish, as well as the kingpinless swivel design that eliminates swivel section failure due to shock and stretching of the kingpin. Caster capacities range from 300 – 1,500 lbs. to suit any needs you may have. Wheel material options include Mold-On Rubber, Mold-on Nylon, Phenolic polyolefin, Performa rubber, Polyurethane HI-TECH, cast iron, and Thermo High Temperature. Wheel diameters can be 4”, 5”, 6” and 8”. With more than 10,000 high-quality caster combinations, Faultless is one of the world’s premiere caster and wheel manufacturers. In order to maintain this distinction, Faultless continues to improve the wheels and casters they manufacture, and the caster designs they produce. SHX 1400 Shock Absorbing Low Profile Casters: These casters have seen extensive testing for a wide variety of impacts and vibration levels that may occur in transportation. This makes them well suited for the moving industry. Designed by Faultless to provide added protection when moving sensitive payloads, these casters include a shock absorbing mechanism to protect the loads during the temporary capacity excess seen during shock. Casters have a corrosion resistant black oxide standard finish with the option of corrosion resistant zinc. Wheels are glass filled nylon, 1 13/16” wide by 3” diameter with load capacities of up to 1,600 lbs. Bestway Casters & Wheels has been dedicated to delivering high quality products at competitive prices since 1975. From their manufacturing facilities in Gromley, Ontario and Laval, Quebec, the team at Bestway casters has earned a deserved reputation for superior performance and dependability in their caster designs. GH/GHR Series Top Plate industrial caster: With a double ball race and extreme stiffening on the fork sides, this is one of the strongest and most dependable casters available for 2” face wheels. This is a very attractive caster model with gold colored dichromate zinc plating. This caster can optionally include a heavy-duty total lock brake that will secure both the wheel and swivel with one push of a pedal (not available on the 4” model). Typical uses are for the garbage container and sandblasting industries where rough usage is the norm. Wheels are 2” wide with diameters of 4”, 5”, 6” and 8” and wheel material options of Phenolic, Laminated Phenolic, Ductile Iron (crowned), Star-tech Urethane and Solid Elastomer (crowned). Capacities of this caster go up to 1,650 lbs. Hx/HXR Series Heavy Duty Casters: This heavy duty caster is made with SAE 1045 drop forged steel for the swivel assembly and comes complete with 5/16” thick legs for added strength. With a 1” diameter nut and bolt kingpin and double ball construction, this is an ideal caster for severe conditions. This unit includes a grease fitting in the head for easy lubrication and has maximum capacities up to 3,000 lbs. At Douglas Equipment we know that our customers want top of the line service when they are picking a caster. Our team has dedicated ourselves to knowing how to find the right caster for your unique needs. We have been in the caster and material handling equipment business for almost 60 years and our team has learned a thing or two about how to match the right caster to your unique needs. From our location in Miami, we can easily provide our top of the line service for the entire United States and we can also quickly ship products to meet the needs of our customers in South America and the Caribbean as well. We can be contacted online where one of our knowledgeable service members will get back to you as soon as possible to answer all your questions. If you would prefer to call and you are local to South Florida, we can be reached at 305-888-3700. National customers can call us toll free at 800-451-0030. When you need the right caster for your job, we are standing by ready to meet your needs.